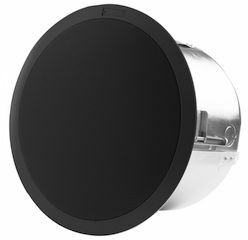 Community's Distributed Design Series of in-ceiling loudspeakers has been expanded to include a standard black version of its flagship D6 model. The new D6-B provides the same high quality sound with very wide, uniform coverage as all Distributed Design Series ceiling systems, making it ideal for nightclubs, bars, restaurants, or any other application requiring a black ceiling loudspeaker. The face-only assembly and optional accessories, including Face Adapter Ring and Can Adapter/Trim Ring are also available in matching black finishes. The D6-B is a true coaxial loudspeaker, with a compression driver concentrically located so that high frequencies emerge through the center of the low-frequency driver via a precisely contoured Tru-Phase HF waveguide. This provides consistent, wide dispersion up to 16kHz. Features of the D6-B include Community's Drop-Stop and Twist-Assist tabs, to make installation easier and faster. The Drop-Stop feature provides spring-loaded legs to support the back-can while the installer tightens the clamps. If the loudspeaker back-cans are pre-installed, the product's Twist-Assist locking allows the baffle assembly to be self-supporting while fastening the screws to the back-can. The D6-B can be used in 8 Ohm or 70V/100V configurations and optimum system configuration can be achieved quickly and easily using Community's free FORECASTER HD Ceiling Distributed System Design Software.